After a well slept night and relaxing in the furo hot tub in the morning, I packed my bags and said farewell to the excellent ryokan Kangetsu, as my next destination would be Kyoto, about 500 kilometers South-West from Tokyo. Why there? Because it's the most valuable cultural center of Japan and is hailed as the location to visit in Japan according to travel guides and people how have been there. So I bought the story and hoped it would be worth the hype. I'll be staying there for six nights before returning to Tokyo. Stopping by Kamata station for a late breakfast/early lunch, I picked a tonkatsu meal which was superb. Here I also noticed that although the restaurant happened to accept credit cards, the Japanese haven't really picked up with this system yet as the waiter handled the card very carefully and went through the process slowly step-by-step. Cash is still considered the number one option around here. After that I headed for Tokyo-station. Since my Japan Rail Pass was now valid for the next seven days, I could freely use the JR-line trains by just showing it at a manned gate. When I had to switch lines at a connecting station, I was once again assisted by a Japanese person! It seems like you just need to look a bit lost near the ticket machine and someone comes over to help you out. In this particular case however, it seemed like the guy was a college student how wanted to practice English with me, which was fine with me. At Tokyo-station I visited a seat reservation office, where I showed my Japan Rail Pass and asked for a seat for the next shinkansen train (bullet train) bound for Kyoto. Japan Rail Pass holders don't have to pay extra for a seat reservation, which is nice. Then I went to the terminal, which had signposts where each numbered car of the train will exactly stop. Once my train arrived and I found my seat, I realized it was on the left side of the train. This meant that I won't see Mount Fuji, unless I take a peek at the right side at some point. The train itself was clean and felt a bit like an interior of an airplane. The speaker announcements were both in Japanese and English (although the latter recorded) and the led-display at the end of the car showed where we were heading. Once the train left Tokyo station, the conductor soon entered the car, welcomed everyone aboard the train, bowed deeply and checked the passengers' tickets. Briefly after this, some train servants wearing rainbow coloured uniforms entered the car with trolleys. They also bowed and walked through the car selling different things to eat. Once they made it to the other end of the car, they turned around, bowed and then proceeded to the next car. Holy politeness culture, batman! The conductor did the same thing when he came back! The servants came several times back selling drinks, snacks and even presents during the trip. Service galore! Spending some time watching the urban scenery and then a blue sea, the speaker announcement said we would soon be arriving at Shizuoka. Huh? Already? That means I missed Mount Fuji completely! The train didn't seem to go that fast, but 130 km in about one hour proved otherwise. Oh well, maybe I'll see it when I come back to Tokyo. Watching the scenery going past and after a short stop at Nagoya, I arrived at Kyoto station. The Kyoto station turned out to be a rather impressive work of modern architecture. For instance it had a gigantic glass-steel "arch" high above the base level of the station. I spotted the Kyoto Tower close by, so I thought that I might as well take a look at Kyoto from above before finding the guesthouse. The view from 100 meters was fine, but not that exciting. 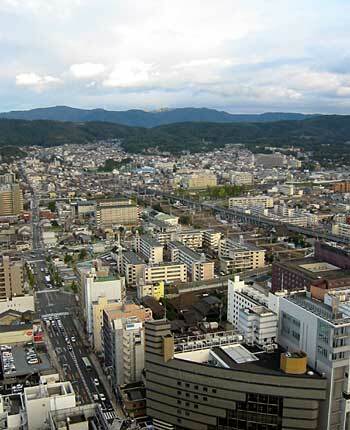 Kyoto however differed from Tokyo by having straight streets, mainly low buildings and mountains surrounding it. Most importantly, it was great to notice how easy it was to move from one city to another with such an excellent railway system Japan had. After a while I found the guest house Club Tour, which was only a 15 minute walk away from the station. The reason why I booked here in advance was the price - about 2,300 yen per night for a dormitory room of four people. Not bad. The guesthouse looked really good for its price and I was warmly greeted by one of the staff members. She showed me the dormitory room, the public facilities and explained the general rules of the house. Since the place was otherwise empty as the other guests were still exploring the wonders of Kyoto, I decided to wander around a bit and took another look at Kyoto station. The sun had set and the station had a Christmas theme going on, although it was still the start of November. The station turned out to have a full sized apartment store and numerous smaller shops in the basement levels and upper floors. On the other end of the station there is an open air high vista, which had a look very nice view of the city. No wonder many teenage couples were hanging around there. As I headed back downstairs, I sat down to admire the bright Christmas tree and listened to a Japanese band play patagonian music. Not really in par with the Christmas theme, now is it? I had to eat something, so I decided to have a break with the Japanese cuisine and try some exotic fast food. I ended up having something "mexican" (it had rice and beans in it). It was served in a hot metal pot in a wooden tray and was eaten with two spoons for some reason. I returned to Club Tour, where some of the other guests had come back from their own adventures. Not surprisingly there were a lot of different nationalities hanging around. I found out that my dormitory mates were from Taiwan, Italy and France (who was only for the following night and later replaced by an Austrian). 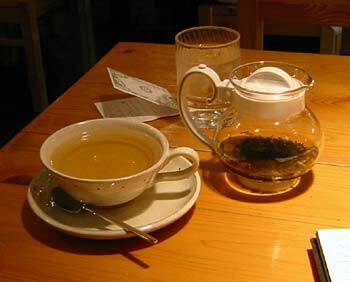 After some small chatting with the others, I decided to take another walk and ended up in a near by cafe, where I had some tea and wrote down some thoughts of the trip so far. After even more walking, I entered a game hall where the noise was LOUD. I took a quick game of Tekken, but I got bored quickly. So I returned to the guest house and went to sleep, only to notice that one of the dormitory mates had a bad habit of snoring loudly throughout the night. I promised myself I'll use earplugs next time. Excellent meal. 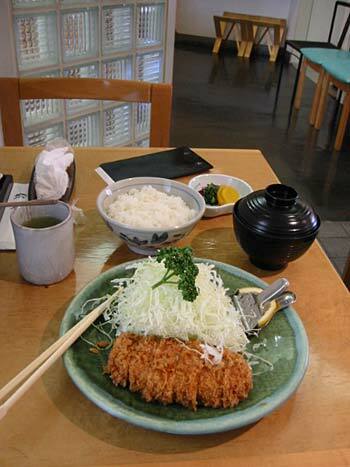 Fried pork - or tonkatsu - with a salad, rice, soup and green tea. 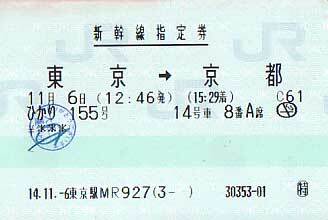 My seat ticket for the shinkansen bound to Kyoto. Inside a shinkansen. 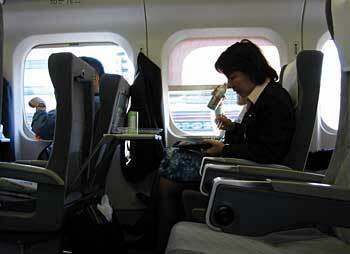 Despite the high speed, the ride was smooth enough for having a nice lunch, which many Japanese also did. Kyoto scenery from Kyoto-tower. Not very inspiring, is it? 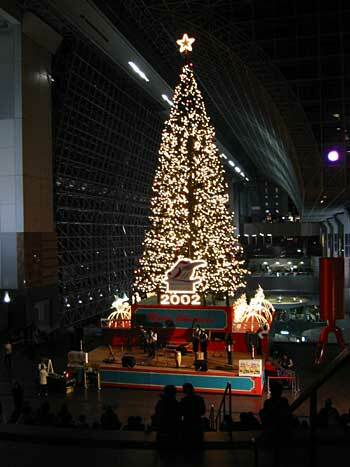 The train station in Kyoto was already in the mood for Christmas. Having a cup of tea in Japan is expensive (this cost 400 yen), but you get the default ice water and a small jar to fill another cup of tea by yourself. 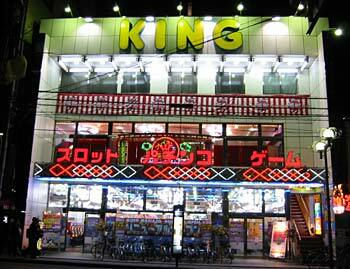 A pachinko hall downstairs and a game hall above it, a very common site in Japan. Kyoto - This is the official website of the city. Kyoto station - A pretty impressive work of modern architecture. Club Tour - If you are looking for a guesthouse in Kyoto that is cheap, yet clean and friendly, then look no further.